Come on a full day adventure to Delta Force Paintball and experience the most exciting activity on dry land! Every week more players are taking on the Delta Force challenge and for good reason; it’s fun, it’s extreme and most importantly of all – it’s safe. Paintball is the perfect way to celebrate an occasion with family and friends. Be it for a birthday party or family reunion, buck’s or hen’s party or just a group of friends getting together to see who is the ultimate paintballer. Whatever the occasion we’re sure you’ll have an absolute blast at Delta Force Paintball. There is nothing better than getting active in an incredible outdoor setting surrounded by your closest friends. With paintball a gun in hand, your protective goggles secured and decked out in the most fashionable pair of overalls, you and your fellow comrades will have the time of your lives. 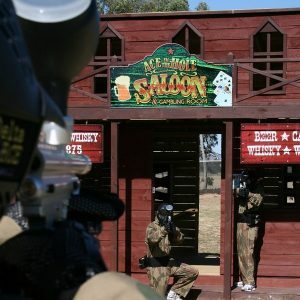 Delta Force Paintball is the world’s largest operator of paintball games and has changed the face of the Australian paintball industry thanks to our movie-set game zones, top of the range equipment and professional staff. 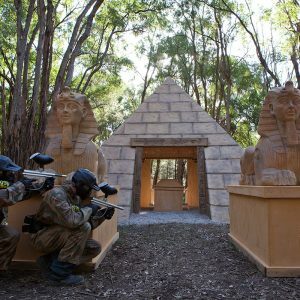 Combining the best areas of Australia’s great outdoors with an incredible amount of movie-set structures and props makes for an incredible day of paintballing. On a full day paintball adventure you’ll experience all facets of the game, from the fast and furious speedball arena to the more strategic Tomb Raider. With varied game zones and the best equipment, your next paintball outing with Delta Force will be safer and more comfortable than ever before. 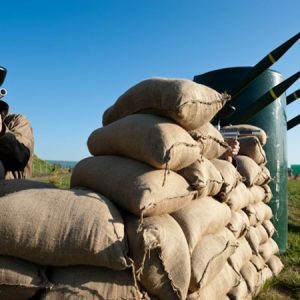 Our purpose built paintball centres have been designed for the ultimate paintball adventure. You will have ample opportunities to ambush the opposition, be it behind the massive pyramid, the village or the communications base. Be sure to also use the natural terrain to your advantage, always be on the move and try to stay at least one step ahead of the enemy at all times. With these few tips you and your team will be well on your way to writing your names into Delta Force history. Our centres cater to groups of all sizes and the facilities in our base camps make it easy to enjoy a birthday celebration at lunchtime so feel free to bring along a cake. It’s a fun day out for everyone involved so round up the troops and get set for an epic battle.